Comedian Lee Kuk Ju opened up about her response to negative comments on her weight. 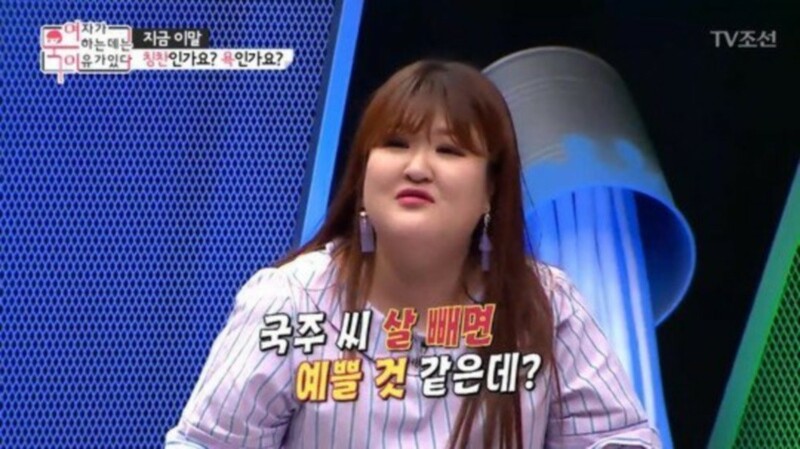 On the June 22nd installment of 'Why Women Get Mad', Lee Kuk Ju responded to Hong Ji Min, who said people always tell her she'd be beautiful if she just lost weight. The comedian stated, "That puts me in a bad mood. That means, 'You don't look good because you're fat right now, so lose weight.'" She continued, "It makes me think, 'Does that mean I'm a mess right now?' I don't feel good. Of course, they say it's because they worry for my health, but I'm not getting fat because I want to die. There are things I try to do to be healthy, and those sorts of comments don't sound good to me." Lee Kuk Ju explained, "When male comedians are fat, they get told they look blessed, but female comedians get told, 'If you lose weight, you won't make money.' Then 3-4 years after that they say, 'You should at least lose some weight though.' How much should I be adjusting myself?" What do you think of Lee Kuk Ju's statements?